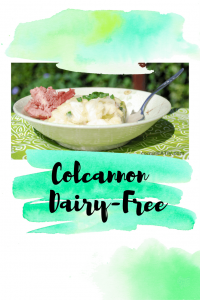 This dairy-free colcannon is a perfect dish to serve with your Saint Patrick’s Day feast. It’s jam-packed with vitamins, minerals, and fiber, which makes this comfort food an all around winner. Wash the potatoes thoroughly, and remove any eyes, or discolored portions. Chop the potatoes into 1 inch chunks, add the potatoes to a large steamer (leave the skin on, as it is the most nutrient dense part of the potato). Steam the potatoes for 10-15 minutes. Meanwhile chop the cabbage into fine strips. Add the cabbage to the steamer, and steam the veggies together for 10 more minutes, or until the potatoes are fork tender. Heat the chicken broth. Combine the potatoes, egg, garlic, and most of the scallions in a large bowl (reserve a few scallions to add at the end as decorations). Slowly add the chicken broth, while mixing the contents. Only add enough broth to moisten the potatoes, but not turn them soupy. Mix in the cabbage. 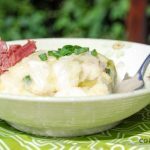 Sprinkle the remaining scallions over the dish as you serve it, and enjoy with your favorite corned beef or pint of beer.